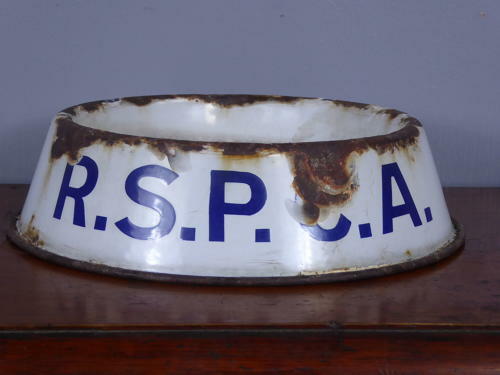 An original early vintage enamel RSPCA dogs water bowl. A seldom seen & charming piece of history which would have been chained up outside a newsagents or shop for passing dogs to drink from, in pressed metal & blue & white enamel. Wear commensurate with age, the bowl has a very naive repair inside & is priced accordingly (the hole which has been repaired is a fraction of the size of the repair so one would assume it was done with function in mind rather than asthetics! ).